The first weekend that Alan and I lived in PA, we decided to go be tourists in our new town. 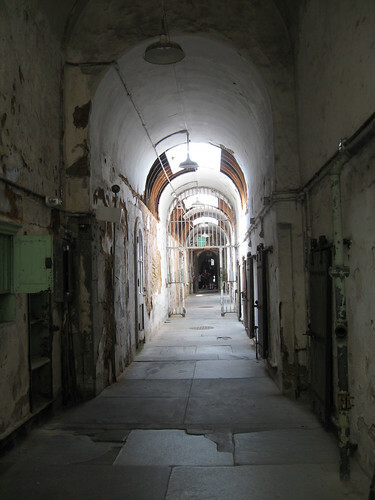 One of the places we visited was Eastern State Penitentiary. We learned about it in grad school and I was super excited to actually get to visit. It opened in 1829 and was considered a revolutionary new prison design because it was designed to create true regret and penitence through solitary confinement of every prisoner. Cells were tiny, with the only light coming from a skylight above. 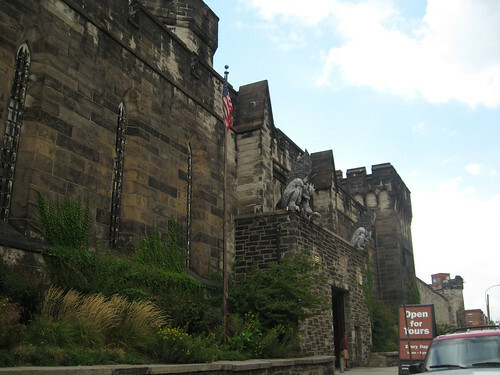 Almost all prisons in the world were designed based on two prisons, one of which was Eastern State Penitentiary. It was designed like the spokes of a wheel, with a central guard station so that they could see what was going on down each hallway from one vantage point. 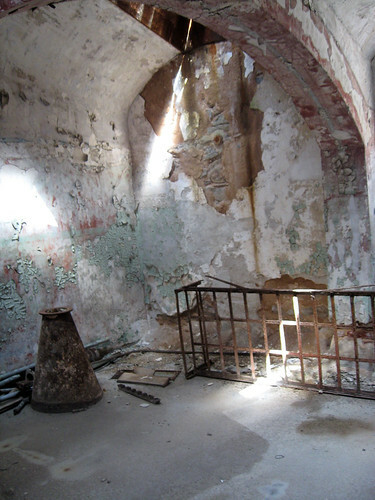 The prison operated until it was abandoned in 1971 and is now in ruins. Lucky for us it is open for tours as a preserved ruin. You get an audio guide and go on your way to explore. Very cool! The former barber shop. This reminded me of something out of Saw. Creepy! There were lots of famous inmates, but probably the most notorious was Al Capone, who spent several months there. 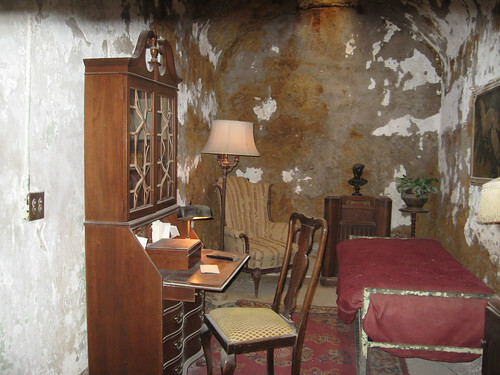 However, his cell was a little more plush than the rest of the inmates. 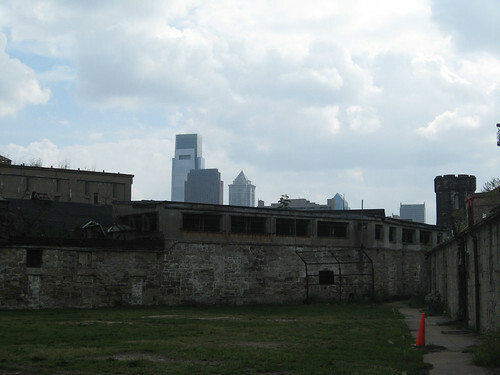 The prison is now located in Philly's Fairmount Park neighborhood and is an urban landmark. We only visited the one time, but it was seriously, seriously cool! So cool; I have a weird obsession with prisons haha I'm sure this one is haunted right!? It is! They do a Halloween thing there every year. Alan always wanted to go but I'm way too much of a weenie for that. I love your travel thursdays! You always have such beautiful photos. 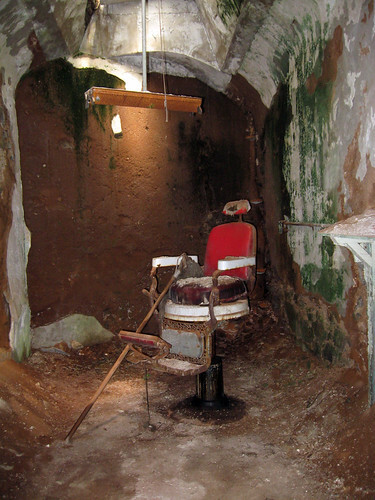 And I agree that barber chair does look like something out of Saw!!! Neat! I never answer phone calls of area codes I don't know. Will have to check this out! I would love to go here! Isn't it considered one of the most haunted places in America? Did your hair stand on end? I love spooky places! My husband photoshopped an image of it that is totally creepy! It probably is. I thought it was really cool to see something we studied in class, but there were some parts that did give me a creepy vibe. It's a major tourist attraction for Philly. If you ever go and get the museum pass, it's on it. I would love to visit there! I have been to tour Moundsville State Penitentiary here in WV 3 times, it is so creepy, I love it! Cool place! We visited a jail in Dublin when we were there, and your pictures remind me of that! I'm not responsible for prize fulfillment so you would need to contact areacode.org. Thanks!